Dexamethasone Tablets USP are available for oral administration containing either 0.5 mg, 0.75 mg, 1 mg, 1.5 mg, 2 mg, 4 mg or 6 mg of dexamethasone USP. Each tablet contains the following inactive ingredients: lactose monohydrate, magnesium stearate, starch, sugar, D&C Yellow #10 (0.5 mg and 4 mg), FD&C Blue #1 (0.75 mg and 1.5 mg), FD&C Green #3 (4 mg and 6 mg), FD&C Red #3 (1.5 mg), FD&C Red #40 (1.5 mg), FD&C Yellow #6 (0.5 mg and 4 mg) and Yellow Iron Oxide (1 mg). 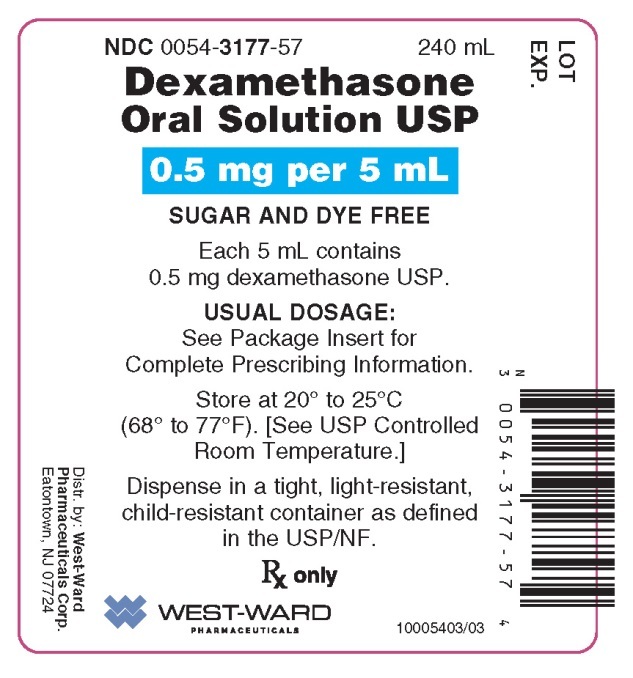 Dexamethasone Oral Solution USP is formulated for oral administration containing 0.5 mg per 5 mL of dexamethasone USP. The cherry brandy flavored oral solution contains the following inactive ingredients: anhydrous citric acid, cherry brandy flavor, disodium edetate, glycerin, methylparaben, propylene glycol, propylparaben, sorbitol solution and water. Dexamethasone Oral Solution USP Intensol™ (Concentrate) is formulated for oral administration containing 1 mg per mL of dexamethasone USP. In addition, the oral solution contains the following inactive ingredients: alcohol 30% v/v, anhydrous citric acid, benzoic acid, disodium edetate, propylene glycol and water. Control of severe or incapacitating allergic conditions intractable to adequate trials of conventional treatment in asthma, atopic dermatitis, contact dermatitis, drug hypersensitivity reactions, perennial or seasonal allergic rhinitis, and serum sickness. Bullous dermatitis herpetiformis, exfoliative erythroderma, mycosis fungoides, pemphigus, and severe erythema multiforme (Stevens-Johnson syndrome). Primary or secondary adrenocortical insufficiency (hydrocortisone or cortisone is the drug of choice; may be used in conjunction with synthetic mineralocorticoid analogs where applicable; in infancy mineralocorticoid supplementation is of particular importance), congenital adrenal hyperplasia, hypercalcemia associated with cancer, and nonsuppurative thyroiditis. Acquired (autoimmune) hemolytic anemia, congenital (erythroid) hypoplastic anemia (Diamond-Blackfan anemia), idiopathic thrombocytopenic purpura in adults, pure red cell aplasia, and selected cases of secondary thrombocytopenia. Diagnostic testing of adrenocortical hyperfunction, trichinosis with neurologic or myocardial involvement, tuberculous meningitis with subarachnoid block or impending block when used with appropriate antituberculous chemotherapy. Acute exacerbations of multiple sclerosis, cerebral edema associated with primary or metastatic brain tumor, craniotomy, or head injury. Sympathetic ophthalmia, temporal arteritis, uveitis, and ocular inflammatory conditions unresponsive to topical corticosteroids. To induce a diuresis or remission of proteinuria in idiopathic nephrotic syndrome or that due to lupus erythematosus. As adjunctive therapy for short-term administration (to tide the patient over an acute episode or exacerbation) in acute gouty arthritis, acute rheumatic carditis, ankylosing spondylitis, psoriatic arthritis, rheumatoid arthritis, including juvenile rheumatoid arthritis (selected cases may require low-dose maintenance therapy). For the treatment of dermatomyositis, polymyositis, and systemic lupus erythematosus. Contraindicated in systemic fungal infections (see WARNINGS: Infections: Fungal Infections) and patients with known hypersensitivity to the product and its consituents. Corticosteroids can produce reversible hypothalamic-pituitary adrenal (HPA) axis suppression with the potential for corticosteroid insufficiency after withdrawal of treatment. Adrenocortical insufficiency may result from too rapid withdrawal of corticosteroids and may be minimized by gradual reduction of dosage. This type of relative insufficiency may persist for months after discontinuation of therapy; therefore, in any situation of stress occurring during that period, hormone therapy should be reinstituted. If the patient is receiving steroids already, dosage may have to be increased. Fungal Infections:Corticosteroids may exacerbate systemic fungal infections and therefore should not be used in the presence of such infections unless they are needed to control life-threatening drug reactions. There have been cases reported in which concomitant use of amphotericin B and hydrocortisone was followed by cardiac enlargement and congestive heart failure (see PRECAUTIONS: Drug Interactions: Amphotericin B injection and potassium-depleting agents). Special Pathogens: Latent disease may be activated or there may be an exacerbation of intercurrent infections due to pathogens, including those caused by Amoeba, Candida, Cryptococcus, Mycobacterium, Nocardia, Pneumocystis, Toxoplasma. Tuberculosis: The use of corticosteroids in active tuberculosis should be restricted to those cases of fulminating or disseminated tuberculosis in which the corticosteroid is used for the management of the disease in conjunction with an appropriate antituberculous regimen. Vaccination: Administration of live or live, attenuated vaccines is contraindicated in patients receiving immunosuppressive doses of corticosteroids. Killed or inactivated vaccines may be administered. However, the response to such vaccines cannot be predicted. Immunization procedures may be undertaken in patients who are receiving corticosteroids as replacement therapy, e.g., for Addison's disease. Viral Infections: Chickenpox and measles can have a more serious or even fatal course in pediatric and adult patients on corticosteroids. In pediatric and adult patients who have not had these diseases, particular care should be taken to avoid exposure. The contribution of the underlying disease and/or prior corticosteroid treatment to the risk is also not known. If exposed to chickenpox, prophylaxis with varicella zoster immune globulin (VZIG) may be indicated. If exposed to measles, prophylaxis with immune globulin (IG) may be indicated. (See the respective package inserts for VZIG and IG for complete prescribing information.) If chickenpox develops, treatment with antiviral agents should be considered. Antibiotics: Macrolide antibiotics have been reported to cause a significant decrease in corticosteroid clearance (see Drug Interactions: Hepatic Enzyme Inducers, Inhibitors and Substrates). Hepatic Enzyme Inducers, Inhibitors and Substrates: Drugs which induce cytochrome P450 3A4 (CYP 3A4) enzyme activity (e.g., barbiturates, phenytoin, carbamazepine, rifampin) may enhance the metabolism of corticosteroids and require that the dosage of the corticosteroid be increased. Drugs which inhibit CYP 3A4 (e.g., ketoconazole, macrolide antibiotics such as erythromycin) have the potential to result in increased plasma concentrations of corticosteroids. 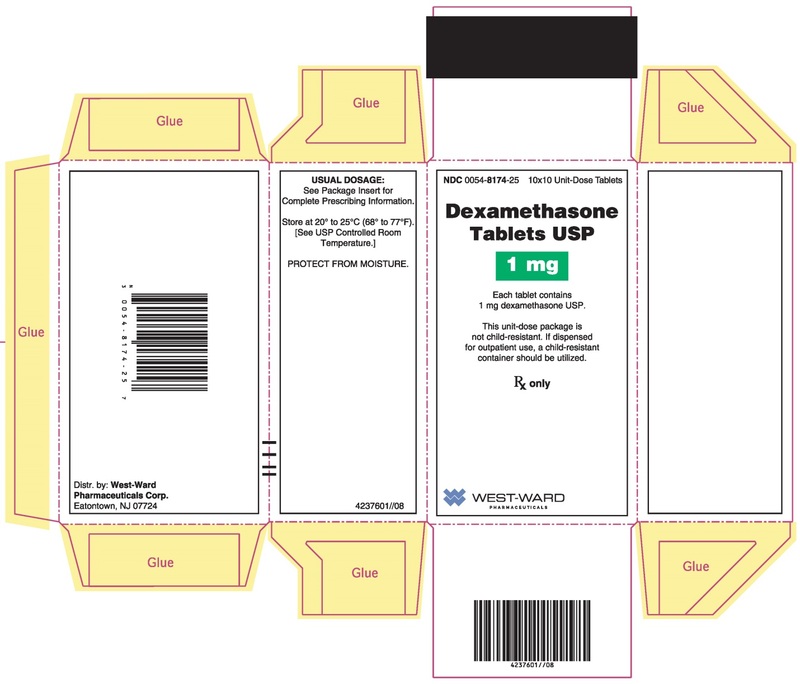 Dexamethasone is a moderate inducer of CYP 3A4. Co-adminstration with other drugs that are metabolized by CYP 3A4 (e.g., indinavir, erythromycin) may increase their clearance, resulting in decreased plasma concentration. Nonsteroidal Anti-Inflammatory Agents (NSAIDS): Concomitant use of aspirin (or other nonsteroidal antiinflammatory agents) and corticosteroids increases the risk of gastrointestinal side effects. Aspirin should be used cautiously in conjunction with corticosteroids in hypoprothrombinemia. The clearance of salicylates may be increased with concurrent use of corticosteroids. Vaccines: Patients on corticosteroid therapy may exhibit a diminished response to toxoids and live or inactivated vaccines due to inhibition of antibody response. Corticosteroids may also potentiate the replication of some organisms contained in live attenuated vaccines. Routine administration of vaccines or toxoids should be deferred until corticosteroid therapy is discontinued if possible (see WARNINGS: Infections: Vaccination). Teratogenic Effects: Pregnancy Category C: Corticosteroids have been shown to be teratogenic in many species when given in doses equivalent to the human dose. Animal studies in which corticosteroids have been given to pregnant mice, rats, and rabbits have yielded an increased incidence of cleft palate in the offspring. There are no adequate and well-controlled studies in pregnant women. Corticosteroids should be used during pregnancy only if the potential benefit justifies the potential risk to the fetus. Infants born to mothers who have received substantial doses of corticosteroids during pregnancy should be carefully observed for signs of hypoadrenalism. Bradycardia, cardiac arrest, cardiac arrhythmias, cardiac enlargement, circulatory collapse, congestive heart failure, fat embolism, hypertension, hypertrophic cardiomyopathy in premature infants, myocardial rupture following recent myocardial infarction (see WARNINGS: Cardio-Renal), edema, pulmonary edema, syncope, tachycardia, thromboembolism, thrombophlebitis, vasculitis. Acne, allergic dermatitis, dry scaly skin, ecchymoses and petechiae, erythema, impaired wound healing, increased sweating, rash, striae, suppression of reactions to skin tests, thin fragile skin, thinning scalp hair, urticaria. Decreased carbohydrate and glucose tolerance, development of cushingoid state, hyperglycemia, glycosuria, hirsutism, hypertrichosis, increased requirements for insulin or oral hypoglycemic agents in diabetes, manifestations of latent diabetes mellitus, menstrual irregularities, secondary adrenocortical and pituitary unresponsiveness (particularly in times of stress, as in trauma, surgery, or illness), suppression of growth in pediatric patients. Abdominal distention, elevation in serum liver enzyme levels (usually reversible upon discontinuation), hepatomegaly, increased appetite, nausea, pancreatitis, peptic ulcer with possible perforation and hemorrhage, perforation of the small and large intestine (particularly in patients with inflammatory bowel disease), ulcerative esophagitis. Aseptic necrosis of femoral and humeral heads, loss of muscle mass, muscle weakness, osteoporosis, pathologic fracture of long bones, steroid myopathy, tendon rupture, vertebral compression fractures. Exophthalmos, glaucoma, increased intraocular pressure, posterior subcapsular cataracts. Abnormal fat deposits, decreased resistance to infection, hiccups, increased or decreased motility and number of spermatozoa, malaise, moon face, weight gain. The initial dosage varies from 0.75 mg to 9 mg a day depending on the disease being treated. In the treatment of acute exacerbations of multiple sclerosis, daily doses of 30 mg of dexamethasone for a week followed by 4 mg to 12 mg every other day for one month have been shown to be effective (see PRECAUTIONS: Neuro-Psychiatric). In pediatric patients, the initial dose of dexamethasone may vary depending on the specific disease entity being treated. The range of initial doses is 0.02 mg to 0.3 mg/kg/day in three or four divided doses (0.6 mg to 9 mg/m2bsa/day). Test to distinguish Cushing’s syndrome due to pituitary ACTH excess from Cushing’s syndrome due to other causes. An Intensol is a concentrated oral solution as compared to standard oral liquid medications. It is recommended that an Intensol be mixed with liquid or semi-solid food such as water, juices, soda or soda-like beverages, applesauce and puddings. Use only the calibrated dropper provided with this product. Draw into the dropper the amount prescribed for a single dose. Then squeeze the dropper contents into a liquid or semi-solid food. Stir the liquid or food gently for a few seconds. The Intensol formulation blends quickly and completely. The entire amount of the mixture, of drug and liquid or drug and food, should be consumed immediately. Do not store for future use. 0.5 mg tablets are supplied as a light yellow, flat tablet with beveled edges, scored on one side and product identification “54 299” debossed on the other side. 0.75 mg tablets are supplied as a pale blue, flat tablet with beveled edges, scored on one side and product identification “54 960” debossed on the other side. 1 mg tablets are supplied as a yellow, flat tablet with beveled edges, scored on one side and product identification “54 489” debossed on the other side. 1.5 mg tablets are supplied as a pink, flat tablet with beveled edges, scored on one side and product identification “54 943” debossed on the other side. 2 mg tablets are supplied as a white, flat tablet with beveled edges, scored on one side and product identification “54 662” debossed on the other side. 4 mg tablets are supplied as a green, flat tablet with beveled edges, scored on one side and product identification “54 892” debossed on the other side. 6 mg tablets are supplied as a aqua, flat tablet with beveled edges, scored on one side and product identification “54 769” debossed on the other side. Store at 20° to 25°C (68° to 77°F). [See USP Controlled Room Temperature.] Dispense in a tight light-resistant, child-resistant container as defined in the USP/NF. 0.5 mg per 5 mL oral solution is supplied as a (cherry brandy flavored) clear colorless solution. 1 mg per mL oral solution is supplied as a clear colorless solution. NDC 0054-3176-44: Bottle of 30 mL with calibrated dropper [graduation of 0.25 mL (0.25 mg), 0.5 mL (0.5 mg), 0.75 mL (0.75 mg) and 1 mL (1 mg) on the dropper]. Store at 20° to 25°C (68° to 77°F). [See USP Controlled Room Temperature.] Do not freeze. Do not use if solution contains a precipitate. Dispense only in this bottle and only with the calibrated dropper provided. Discard opened bottle after 90 days.